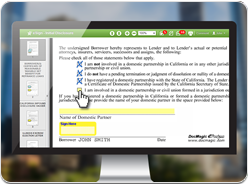 TORRANCE, Calif.—January 15, 2014—DocMagic, Inc., the leading provider of fully-compliant loan document preparation, compliance, eSign and eDelivery solutions for the mortgage industry, has announced that it has a variety of solutions available today that easily and efficiently enable a lender to be compliant with the ECOA Valuation Rule, no matter what the lender’s business rules are. 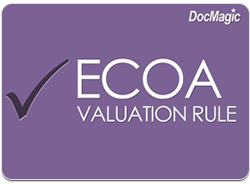 Under the ECOA Valuation Rule, a creditor must provide an applicant with a copy of the appraisal and other written valuations "upon completion, or three business days prior to consummation of the transaction, whichever is earlier." This means that the lender must prove that in fact, the delivery of the appraisal occurred within the prescribed time requirements. 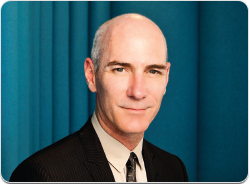 If the appraisal is revised, then a new appraisal must be sent to the borrower. The appraisal or written valuation must automatically be provided, regardless of whether credit is extended, denied, incomplete or withdrawn.